Makino’s MCC-VG Series of horizontal machining centers are designed to streamline the machining and processing of large dies and molds. The variable geometry (VG) head provides the ability to perform roughing and finishing operations in a single setup, significantly reducing manual labor and out-of-cut times. A compact spindle design combined with the VG tilting and rotating head offer high-precision machining capabilities even in complex, difficult-to-reach three-dimensional surfaces. This also allows for the use of shorter tools to reduce vibration and improve tool life for high-quality blending and finishing. MCC-VG machines come standardly equipped with a 12,000-rpm spindle supported by cylindrical roller bearings for a wide range of jobs. Makino’s patented spindle core cooling system cools the rotating spindle directly from the inside, minimizing thermal distortion for improved accuracy even during long hours of unattended machining. 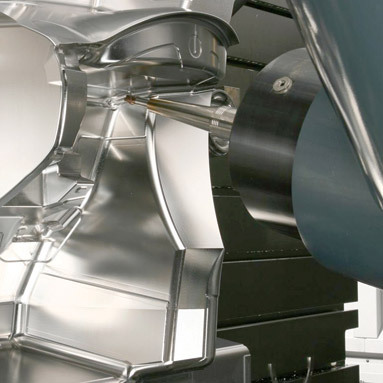 Makino’s Super Geometric Intelligence (SGI.4) control technology moves the tool smoothly along the commanded path, and a high-response servo and high machine rigidity work in concert to deliver superb machining accuracy that does not change even at high cutting speeds.